Here at RHHR, we go above and beyond for our huskies. We provide comprehensive veterinary care, obedience training, appropriate socialization, individualized affection time, offer enrichment opportunities,, play soothing music in their kennels, and much more! Jennifer is a practicing attorney, artist, outdoor enthusiast, and a founder of RHHR. Jennifer has rescued four Huskies. Sage, pictured here, is a registered Delta Society pet partners therapy dog. Kelly Lambert is a practicing attorney and a founder of RHHR. She rescued her first Siberian Husky, Raven, in 2008. Kelly and Raven participated in agility and volunteer therapy until Raven's passing in 2015. Raven was such a special dog to Kelly that she inspired Kelly to found the rescue with Raven as its namesake. Laurie always dreamed of owning a Siberian Husky. In 1996, she finally got her first Husky, Dylan. Laurie is currently on her third and fourth huskies - Hugo and Kelly! Laurie is excited to be a part of RHHR, and she knows that this organization is going to help ensure that these beautiful animals find a home. Glenda is a tax auditor for Massachusettts Dept. of Revenue. She is a certified scuba diver, and enjoys participating in and instructing various sports. She has always rescued her dogs, and the biggest love in her life is her greyhound T2 (aka Tony) who is 9. Anne owns and operates her own business, herb/o/logy, in local Genoa, IL. 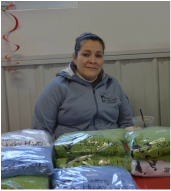 In addition to her work on the board, Anne's business has a canine line - "Canine Companions" - that donates 100% of its proceeds to the RHHR huskies! Anne shares her home with three rescue Puggles: Sarabi, Chaz, and Fina! Gaby is very excited to be a part of RHHR! She has a passion for rescuing dogs, and currently shares her home with her adorable American Bulldog! Kristen is the manager at RHHR. For Kristen, it is all about the dogs - are they comfortable, are they loved, are they medically cared for, do they have good, healthy food, and for sure do they have enough treats. Kristen is a retired military veteran, having served 29 years in the United States Army. Her deployments include Panama, Kosovo and Iraq. Devoted service to our country uniquely led Kristen to dog rescue and, ultimately, to RHHR. After her discharge from the Army, Kristen received Max, an adorable and loving rescued Husky, as a therapy dog (before it was “trendy,” Kristen will say). Kristen was so grateful for Max’s service to her, and so impressed with the healing and joy Max provided, that she was inspired to become involved in dog rescue. 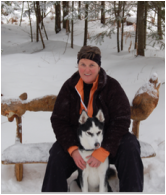 She began very actively volunteering in 2009 with Northern Lights Sled Dog Rescue, a husky rescue in Indiana. Again, her dedication and inclination to service bloomed, and Kristen built a multi unit foster kennel on her property, and worked in all aspects of rescue (specializing in huskies), including providing a home, love and care to medically challenged huskies and puppies entrusted to her care. Kristen’s son, Sam, 24, currently lives in Florida after receiving a Master’s Degree from the University of Oregon. Kristen’s family resides in South Bend Indiana.